Who Does the VentureOne Card Appeal to Most? Decision Time: Is the Capital One VentureOne Right for You? Anyone who travels a lot will love having a good travel rewards credit card in his or her wallet. When you have access to a credit card with travel rewards potential, it can help to mitigate some of your travel costs. The ability to earn rewards for your purchases makes your travel experience that much nicer. When you sign up for a good card, it can even offer you various perks that will ensure that you have a smooth experience while on the road. There are many travel credit cards options and some of them come with hefty annual fees. If you travel a lot, then the premium travel rewards cards may be practical for you. Those who travel a bit more sparingly may still want access to a rewards card but will be less keen on paying a big fee just to get access to the card. This is why the Capital One VentureOne Rewards credit card is proving to be so popular. This is a very cost-effective card that offers cardholders good overall rewards potential. If you have been waiting for a card that keeps your costs low while also providing you with good benefits, then this might be it. Even so, you want to be able to make an informed decision. That is why we are going to be reviewing the Capital One VentureOne Rewards credit card in depth today. Join us as we look over all of the features and benefits of this credit card. We will take a close look at the rewards potential of this card and it will be easier for you to determine whether or not this credit card is a good fit for you. Read on to get the necessary information and you will be ready to make your decision in no time. You’ll earn 20,000 points after you spend $1,000 in the first 3 months. You’ll earn 1.25X miles on every purchase. This is a good no fee travel credit card. It offers a decent introductory offer and is one of the only no-fee cards to have airline and hotel travel partners. One of the most appealing aspects of this credit card is the fact that it does not have an annual fee. If you are looking for a travel rewards credit card that has no annual fee, then you will not find a better option than this. This card offers you great rewards potential while keeping your costs very low. Being able to enjoy a good rewards rate without an attached fee means that you can use the card as much or as little as you need to without worrying. Another fantastic benefit is that this card does not have any foreign transaction fees. Depending on how your traveling habits are, this may be really great news. If you travel outside of the country on vacation sometimes, then you will be able to use this credit card without any worries. No foreign transaction fees will be getting in your way while you are using this credit card. This credit card also comes with a very nice introductory APR offer. You can enjoy an introductory APR rate on purchases for the first 12 months. This allows you to avoid interest and will make it more practical to carry a balance for the first year of being a cardholder. The regular APR falls within normal variable ranges, making it pretty inoffensive overall. Surprisingly, this credit card does not have a balance transfer fee either. Most credit cards will at least have a 3% balance transfer fee so this is a somewhat nice feature. Regardless, this is not really a balance transfer credit card so the utility of this is not going to be all that high. It is still worth noting, though. The sign-up bonus for this credit card is worth mentioning due to it being very easy to obtain. As is standard for most credit cards, you can earn the bonus by meeting a spending threshold in the first three months of being a cardholder. This will allow you to earn a substantial number of miles that will help you to pay for some of your travel expenses. It is not a huge sign-up bonus but it is more than adequate for a card with no annual fee attached to it. There are several good benefits that you will be able to take advantage of when using this credit card too. For instance, this credit card gives you access to travel accident insurance at no extra charge. As long as you use this card to pay for your travel bookings, you will always be able to rely on this coverage. It helps to keep you safe while you are out traveling and is a very worthwhile benefit. Another good benefit that you will use regularly is the rental car coverage. Being able to use your credit card in order to receive rental car coverage is pretty standard but it will be useful nonetheless. This can help you to avoid using your own personal car insurance in case something happens. You need to pay for your rental car with the credit card to take advantage of this coverage, of course. You can also enjoy extended warranty coverage on many items that you buy with your credit card. Items with warranties will be extended by an extra year when using this credit card. Not all purchases will be eligible for this but it can help to keep many things under warranty for longer periods of time. It is a good passive benefit that can help you to avoid costs when something goes awry with an item within the first few years. Another benefit that needs to be brought up is that this card has a partnership deal with Hotels.com that will prove to be very helpful. When you use the website to book your hotels, you can earn 10 miles per dollar. This deal is good through January 2020 and will help many people to earn rewards miles easily. If you use this website to book your hotels all the time, then this credit card makes even more sense for you. The rewards program for this credit card is actually very good for a card that has no annual fee. You will be able to earn 1.25 miles for every $1 spent on all of your purchases. This is good because it does not limit you to spending money on certain categories. Whatever you decide to purchase is going to help you to earn those rewards miles that you need. You can earn the increased rewards mile total of 10 miles per $1 spent when booking through Hotels.com due to the special partnership. This is an offer that works through January 2020 and it can really help you to earn a lot of miles quickly. If you stay at hotels often enough, then you will be racking up miles at a much higher rate than usual. This is good for anyone who likes using this website and will be convenient for many people. The rewards redemption options are particularly good with this credit card too. You are going to be given many different options for redeeming your earned rewards miles. Of course, you can book flights directly through Capital One’s travel platform. There are also many partner businesses that will allow you to transfer your miles over to various travel programs. You can also choose to receive statement credit instead of using your earned miles in a more traditional way. It is good to have the option but this is not going to be as cost-effective as the other redemption methods. In order to do this, you can pay for travel and then use your miles to help pay for the expenses as a statement credit. It is not complicated and should be easy to do if you decide that you want to go that route. Being able to enjoy a travel credit card with no annual fee is going to be a treat. Most cards without an annual fee will not offer you the most robust options. This is not the case with the Capital One VentureOne Rewards credit card. It keeps your costs low while still giving you great features to enjoy. You will not have to put up with any foreign transaction fees while using this credit card either. The lack of a foreign transaction fee is definitely very beneficial. You can use the card while you are traveling abroad without having any problems. This gives you more flexibility with how you use this credit card and will make it more desirable for people who travel outside of the country regularly. It is important to note that this credit card has a pretty good rewards rate for a travel credit card with no annual fee. You'll be able to earn 1.25 miles for every $1 spent on any purchases. It doesn't even limit you to purchases in certain categories when using the credit card. You can earn rewards miles for buying groceries just as easily as you can for purchasing airfare. The Hotels.com partnership is one of the big reasons why this credit card is jumping in popularity lately. Being able to earn 10 miles per $1 spent is a great rewards rate that you should take advantage of while you can. This partnership is active through January 2020 and will work to help customers earn rewards miles at a drastically increased rate. If you stay at hotels somewhat often, then this should certainly be on your radar. The flexible redemption options for your rewards miles should also be mentioned. You can make use of many options when it comes time to redeem your miles. It is possible to book travel through the Capital One Travel portal or you can transfer the miles to partner businesses. There are even statement credit options to consider so the choice of how to use your earned rewards is certainly placed in your hands. There are credit cards with higher rewards potential. There are no luxury perks. Cash-back rewards options are not great. There are some credit cards out there with more rewards potential. The basic rewards rate of this card is only 1.25 miles per $1 spent. There are many options out there that allow cardholders to earn two miles per $1 spent or more. Many of these will have annual fees attached to them but you should still know that the rewards potential of this card is outmatched by some other offerings. You will also not be able to take advantage of any luxury perks while using this credit card. The benefits of this credit card are more basic than some other travel credit cards. If you want better perks, some cards with $95 annual fees may offer access to greater travel benefits. Depending on what your needs are, it might be worthwhile to look for a card with better overall perks. The cash-back rewards options for this credit card are not great either. It is good to have the option but it will not be the most cost-effective way to use your earned miles. You may want to avoid getting a statement credit for your miles if you want to make the most out of the rewards program. Booking your travel through the Capital One Travel portal is likely the simplest and best thing to do. In order to be approved for this credit card, you will need to make sure that you have a high credit score. Scores that fall in the very good range will be eligible. It is recommended that you have a score of 690 or higher if you are thinking of applying for this credit card. It will be a good idea to check your credit score first just to make sure that you meet the score recommendation. The Capital One VentureOne Rewards credit card can really appeal to many different people. It is a good credit card for people who only travel somewhat frequently. When you travel enough to want a good rewards card but don’t travel so much that it warrants a card with a high annual fee, this one makes sense. It offers good rewards potential and various benefits that will make your travel time much nicer. This is also an appealing credit card for those who like flexible redemption options. There are many ways that you can use your earned miles and there are several transfer partnerships to consider. It is even possible to get statement credit instead if you would like to go that route. People love being able to have choices and this credit card gives you all the options that you could want. The interesting partnership with Hotels.com makes this card desirable too. If you are a regular user of this site, then being able to get 10 miles for every dollar spent on the site is perfect. It can lead you to some really good rewards by being able to earn miles at this rate through January 2020. If you do your hotel booking through this site anyway, then this is a credit card that you should sign up for as soon as possible. There are many alternative travel credit cards that may work better in some situations. It just depends on what your travel habits are and how often you decide to travel. If you travel multiple times per month, then signing up for the normal Capital One Venture Rewards credit card may offer you increased rewards potential. This card can offer you two miles per $1 spent and it can be more lucrative for frequent travelers because of this. 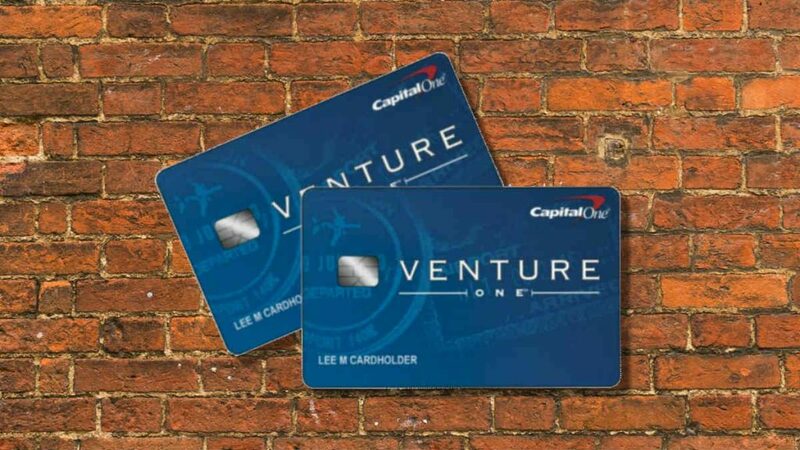 See our full review of the Capital One Venture Rewards card. There are also some enhanced perks to consider when signing up for the Capital One Venture Rewards credit card. You can get application fee credit for the Global Entry and TSA PreCheck programs. This more than pays for the $95 annual fee of the card. To add to this, the Capital One Venture Rewards credit card has a bigger sign-up bonus than the VentureOne card. Depending on how often you will use the card, it may be a better option for you. Overall, the Capital One VentureOne Rewards credit card is a great option for many people. If you travel somewhat frequently, then this card is going to really prove to be useful. It offers you various benefits while giving you a good rewards rate that will make your hotel stays that much nicer. The partnership with the Hotels.com website makes a big difference too so it’s perfect if you love to use that site. Simply being able to gain access to a credit card that offers you so many positive features is great. The fact that the rewards program is so good when there is not even an annual fee attached to the card is astounding. It makes it very easy to recommend this credit card to most people. Really frequent travelers may find some increased potential in cards with high annual fees but this one is going to work perfectly for everyone else. Don’t hesitate to apply for this credit card if you need a simple-to-use card that has good travel rewards. The flexible redemption options make it easy to use your earned points and give you several options. You won’t have to deal with high fees with this card and it even avoids foreign transaction fees entirely. It is a worthwhile travel credit card that should serve you well.